B is the numerical equivalent of 2 and represents the first duality, the energy bouncing between two opposites; bombastic and benign. Emotionally triggered reactions bursting forth from balanced containment. In the Hebrew alphabet B means “house” – a box (a home base) with boundaries for emotionally bonded people and things. B’s beautiful side is bountiful, benevolent, bonafied and enjoys bonding activities. 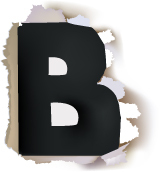 Negatively, B can be beligerant, brutal and brash – a big bully.